The DIY-36 system provides 34,400 BTU of cooling and 36,000 BTU of heating. A Mr Cool DIY Series heat pump is the only ductless mini-split system on the market explicitly designed for amateur installation. You don't need special tools or training to install this high efficiency heat pump. The linesets precharged with R410A refrigerant, the quick hook-up electrical connections, and the quality engineering mean just about anyone can install a Mr Cool DIY in their home with no problem at all in only a few short hours. If you want great air comfort without paying an arm and a leg for installation, you want an easy-to-use Mr Cool DIY Series ductless heat pump. One of the most difficult aspects of typical heat pump installation is dealing with the refrigerant inside the coils. The Mr Cool DIY Series comes with precharged linesets alleviating one major obstacle to amateur installation in a single stroke. 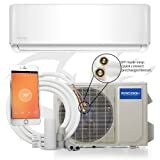 Garrison Inverter ductless air conditioners provide consumers with cooling solutions that are environmentally friendly utilizing R410A refrigerant. Conserve energy by cooling or heating only the spaces where you are. Inverter heat pump technology constantly adjusts output to maximize comfort and minimize energy cost. Includes remote control for ease of operation. Features dehumidification mode, louver position memory , auto-restart,turbo mode, sleep mode. Temperature display on indoor unit.